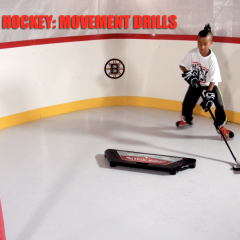 In this video (part 2 of 2), Jeremy Rupke takes us through some skating and stickhandling movement drills on the HockeyShot synthetic ice that will improve your hockey skills. Also, Steven J. Wong’s son, James, hops on set to help out with the drills. 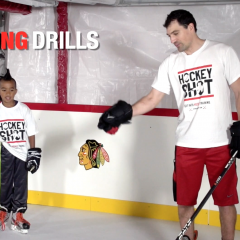 In this video (part 1 of 2), Jeremy Rupke takes us through some passing drills on the HockeyShot synthetic ice that will improve your hockey skills. Also, Steven J. Wong’s son, James, hops on set to help out with the drills. 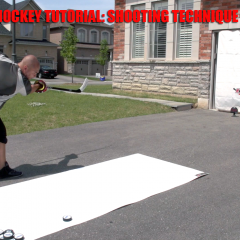 In this segment (Part 5 of 5), Steven J. Wong instructs Jeremy Rupke (How To Hockey / The Hockey Movement) and JF Cormier (HockeyShot.com) on the last of five essential WongMania exercises to develop explosive power for Hockey players – today it’s all about the single legged squat.